Holland-Netherlands: SNG satellite uplink trucks. 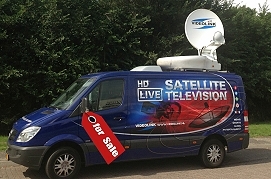 Netherlands, October 2016: Videolink, which owns two SNG uplink trucks, is selling one of the vehicles due to broadcasters in Holland increasingly switching from satellite to cellular transmissions. Peter Dokman, managing director of Videolink, said, "We are selling our full redundant HD SNG due to the fact that the demand for SNG trucks in The Netherlands is going down. Our company is migrating to 4G systems to keep up with the current changes in the broadcast world." The Mercedes Sprinter truck made its first live transmission in 2012 and has been used mainly for live news events in the Netherlands. The asking price for the vehicle is €150,000. Videolink has set up a web page to help find a buyer for the vehicle [http://videolink.nl/sngforsale.html]. If you would like to contact the seller, please call +31 653 757 029 or email to info@videolink.nl.